Being a Bengali movie buff, Bomkash Bakshi is always been my favorite and I can’t really wait to watch the serious in the theater. Every series of Bomkesh Bakshi is able to thrill me from my childhood. But in my busy schedule, I can’t always able go and watch the movie in theaters. So today I’m happy to share that there is one click app “Hoichoi” available to reach our most favorite series of Bengali movies. 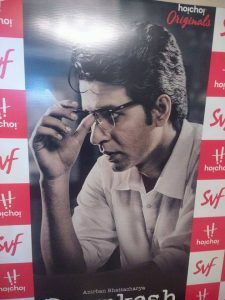 Hoichoi is the world’s largest digital Bengali entrainment content platform, has released the teaser video of Byomkesh, its much-awaited original web series. When the first episode premieres on Saturday, 14th October on Hoicoi. It will make history as the first Byomkesh series to be available on an OTT platform worldwide. This, the coolest avatar of Byomkesh ever has been produced by SVF, East India’s Largest entertainment company. Byomkesh is one of the most celebrated Bengali fictional detective characters and the stories have been adapted into several versions for films and TV. Byomkesh Bakshi is one of the most celebrated Bengali fictional detective characters. Set in the 1930s, the series is based on the adventures of Byomkesh and his friend and biographer Ajit, who usually accompanies Bakshi during his investigations. Anirban Bhattacharya, recently seen in the critically-acclaimed film Dhananjoy, will be portraying the lead role of Byomkesh, while Subrat Dutta( of Talaash and Tever Fame) portrays the role of Ajit. Ridhima Ghosh would be seen as Saryabati, Byomkesh’s better half. So get your popcorn ready to see your favorite series of Byomkesh on the Hoicoi App from a cozy corner of your home. You can download the Hoicoi app directly on your Android or iOS phone.